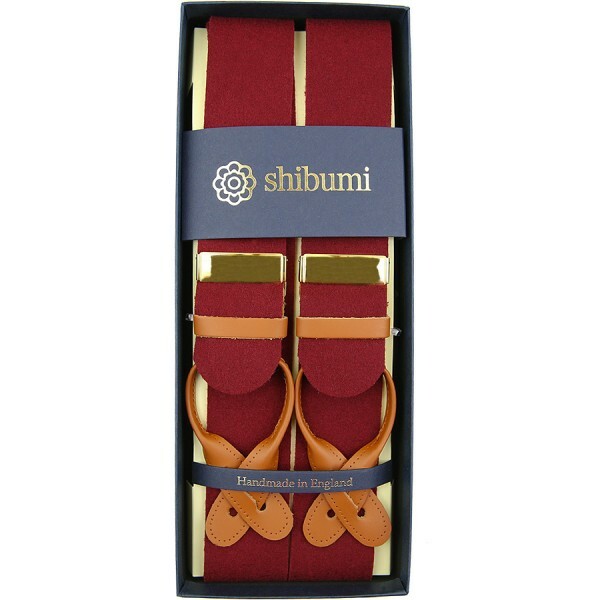 Product information "Boxcloth Braces - Burgundy"
If one could only have one pair of braces, these would be a very good choice. Just like with bordeaux ties, this accessory is incredibly versatile. Goes just as well with formal outfits like a navy suit, white shirt, bordeaux grenadine tie, white linen pocket square, bordeaux socks and dark brown oxfords, as with more sporty ones like with a brown jacket, light grey pants, blue OCBD, navy pocket square, green knit tie, navy socks and suede derbies. Made in a small, traditional manufacture in the heart of the UK, our braces combine the best of British craftsmanship with classic, timeless designs. From traditional boxcloth felt in a variety of colors (the same material, by the way, that is also used in world-class pool tables) to seasonal variants in linen or tweed, made in cooperation with the best cloth houses of the world, including Hardy Minnis and Dugdale: the right braces for every occasion and style. Braces are by far the most comfortable method to keep one’s pants up. Since the braces are hanging from the shoulders, there is no uncomfortable pulling at the waist. Related links to "Boxcloth Braces - Burgundy"